This is the homepage of the North Hertfordshire Archaeological Society. Here you will find details of our lecture programme, our excursions and fieldwork opportunities. North Hertfordshire Archaeological Society was established in 1960 and has undertaken a wide range of research into the archaeology and heritage of the district since then. It has a regular lecture programme, occasional visits and guided walks, and is involved in local fieldwork, including survey and excavation. 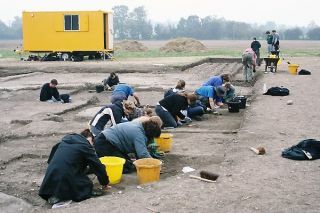 Today, most archaeological fieldwork is carried out by professional organisations as part of the local authority planning system, but the Society still thrives. It provides lectures, visits and social events as well as published information and has a healthy membership still drawn from people in the North Hertfordshire and South Bedfordshire districts with a keen interest in the past. Members are able to keep in touch with discoveries and developments in archaeology and many lectures and courses are provided to help with a greater understanding of our special local landscape.